On July 5, 1983, "Rest In Peace" were the last words uttered by bass player David J as he left the stage announcing to an unsuspecting audience and crew that BAUHAUS had just played their final concert. Shortly after, a press release followed confirming that BAUHAUS had disbanded. It is one of the ironies of rock music that a handful of groups, such as The Velvet Underground or The Doors, only gain their influential reputation with hindsight. It is safe to say that BAUHAUS are clearly among that handful of groups. Even though BAUHAUS broke up in 1983, fifteen years later their back catalogue sells better than ever. Their style is still very much contemporary, and the live shows are now legendary. With their own particular mystique and stark brooding music, it was inevitable that BAUHAUS would be classified with the vanguard of the "Goth" fashion, a totally misleading confinement which ignored their humor, experimentation and uniqueness. Unlike their imitators, BAUHAUS were never confined to Goth music or Goth fans. Their appeal was, and is, far broader and is enjoyed by the discerning music fan. An example of this appeal can be found in a quote from a recent article in the London Times, "In the early eighties, BAUHAUS were one of Britain's most revered cult bands...pioneering a raw post-punk sound, this etiolated quartet enjoyed four years of fringe success before disbanding..."
Their dramatic look, theatrical performances and unique sound blossomed into a lifestyle and set the standard for the endless number of clones who followed in their wake. Much of their sound was indeed dark, distinct and intense. But attempting to neatly classify their music has caused people to miss their creativity, adventurousness and pure rock and roll energy. During the late 70's, in Northampton, England, a provincial town in the Midlands, brothers David J and Kevin Haskins, who had been through a number of short-lived band incarnations, recruited Daniel Ash, a friend of Davids since kindergarten. One night at a pub where the three were performing, Daniel ran into his old school friend Peter Murphy. Shortly after that chance meeting, Daniel asked him to join the band. The two of them began writing together and within a month they joined forces with Kevin and David J. Taking a name from the minimalist German art and design school with ideas parallel to their own, they became BAUHAUS. Originally, the name BAUHAUS was suffixed "1919", the year that their namesake was founded in Weimar, Germany. On New Year's Eve of 1978, BAUHAUS played its first gig with the full line up at the Cromwell Pub in Northampton. In August of 1979, the band released a 12" single on Small Wonder Records, which was recorded in one take, shortly after that first appearance. "Bela Lugosi's Dead" not only became BAUHAUS' signature song, but an anthem for the gothic rock scene which the band is credited for having spawned. The band later performed the song in a cameo appearance in the cult classic film "The Hunger". BAUHAUS' live shows were already attracting an audience. As with their music, they did not want their shows too traditional and obvious. The band went to great pains to create their own minimal lighting effects -- one strobe, white light only, lights placed on the floor rather than ceiling, and videos on a single, small screen. The bands shows were theatrical, mesmerizing, intimidating and intense. In 1980, BAUHAUS was signed to the fledgling 4.A.D. label, releasing three singles and their first album, In The Flat Field, widely aknowledged as one of the finest debut albums of the early 1980's and the first of many of their releases to appear on the UK charts. In September of that year, BAUHAUS made their debut performances in the United States. On the verge of broader success, BAUHAUS moved to the Beggars Banquet label and released the danceable, more commercial single "Kick In The Eye." With the release of their second album, Mask, a more mature and melodic album, BAUHAUS began touring extensively in the UK and abroad. But they still hadnt found breakthrough success. The next single, "Spirit" made it into the UK top 50. It was only when the group recorded a cover version of David Bowie's "Ziggy Stardust" that BAUHAUS hit the UK top 20 . The single also included covers of Brian Eno's "Third Uncle" and The Velvet Underground's "Waiting for the Man". These cover songs combined with jeering artwork (that incorporated the Aladdin Sane's signature lightning bolt superimposed over the recognizable BAUHAUS face logo) mocked the UK press's continued charges of BAUHAUS not being original. Following that, their new album, The Sky's Gone Out, entered the LP charts at number four. As the band began work on their next record, Peter Murphy was stricken with viral pneumonia and by the time Peter recovered and rejoined them, the rest of the band had already recorded half of the album, Burning From The Inside. The album while critically acclaimed, was diverse and in many ways signaled what was to come. The album had just risen to the UK Top 10 when the band announced that they were separating. Between 1979 & 1983, BAUHAUS turned a lot of heads, ruffled a lot of feathers & won the hearts of many fans. They also had 3 appearances on the UK's famed TV music show, "Top of The Pops" & several releases reaching the UK top 10. Few bands can claim that they caused the genesis of a new culture. Like it or not, BAUHAUS hold that title. Since 1983, the legend of BAUHAUS and their inherent culture continued to grow through their own generation as well as through younger generations. Though the commercial success of BAUHAUS has subsequently been eclipsed by the group's individual projects (Tones on Tail, Love And Rockets & Peter Murphy solo), their musical legacy still remains highly influential -- the mark of a truly great band. While the legend of BAUHAUS lived on through the years, in interview after interview, the members said that a reformation would never happen. In 1998, after many rumors and offers over the years, the four original members of BAUHAUS agreed to play together once again. The winning incentive for BAUHAUS to resurrect themselves was not to revel in nostalgia. It was, in fact, understanding their relevance in todays music with a young audience. In May of last year, BAUHAUS announced they were to reunite for two shows in Los Angeles on July 10th & 11th at the Palladium. Both shows sold out in record-breaking time. BAUHAUS had sold 8,000 tickets in less than 15 minutes. When a third show was added, it too sold out in a few hours. Soon, BAUHAUS added dates in major markets all over North America. Because of the massive anticipation and excitement going into BAUHAUS first live appearance in 15 years, there was intense pressure for BAUHAUS to live up to their reputation and their legend. Could BAUHAUS be as good and as vital as they were 15 years ago? Could BAUHAUS retain their title as the forefathers of dark rock? Not only did they meet those expectations, but, they blew past them! During their Resurrection Tour, BAUHAUS went on to play to packed theatres all over North America. They also extended their tour overseas and throughout Europe ending their tour in Lisbon, Portugal, in front of 10,000 elated fans. BAUHAUS went on to play over 50 shows and were greeted by loving audiences during each visit. Even though there were many more invitations to tour in other cities/countries, there was not enough time to extend the tour beyond the 50 or so shows. In November 1999, Metropolis Records presents GOTHAM, a live double CD and video, which was recorded at the Hammerstein Ballroom in New York during the Resurrection Tour. With it's aptly "tongue in cheek" title, this album features 17 live songs carefully selected from their catalog plus a live recording and a studio recording of their cover of Dead Can Dance's "Severance". 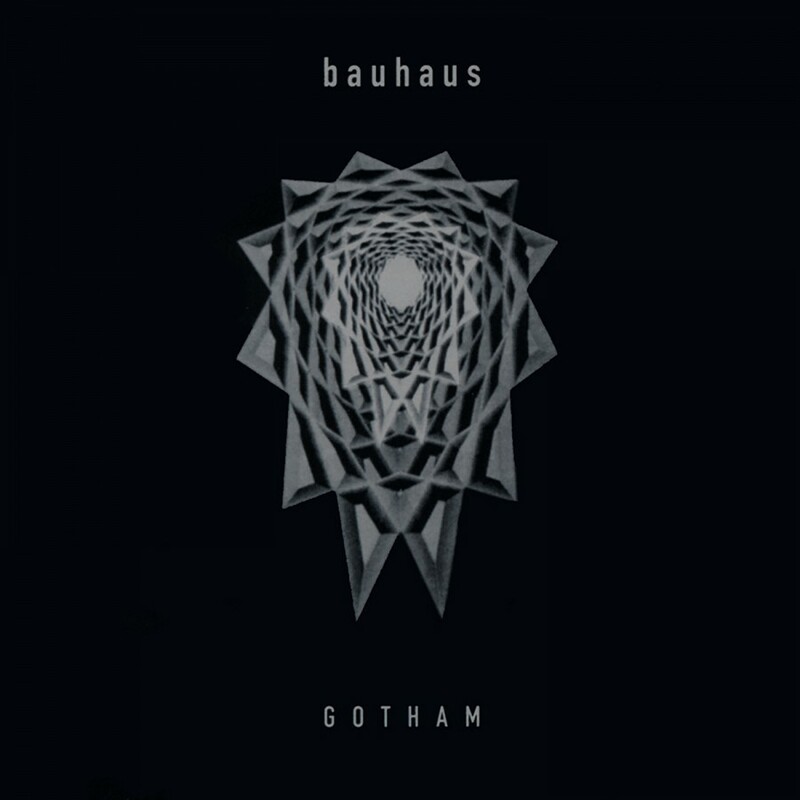 This studio version, recorded last year during the tour, is significant as it landmarks BAUHAUS' first studio recording in 16 years. GOTHAM historically documents The Resurrection 1998 Tour. It is not only a must for BAUHAUS fans but is also a treat for any discerning music fan. The bands powerful presence, their dramatic flair, their unbridled energy and talent are all captured in GOTHAM. Never before has a band broken up and then reformed 15 years later to find they have grown many times in stature and with a whole new generation of fans!